aesthetics | Why you drive bad?! 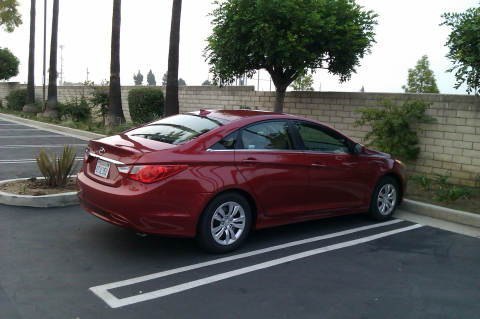 Arriving at the airport, I had a choice of a Chevy HHR (which I had already driven) or a Chrysler 200 (puke!) in my class. Fortunately for me, this red Sonata was parked near the Chrysler so I decided to upgrade to this for my weekend ride. It already looks like a much higher quality car than the marque suggests and it certainly couldn’t be worse than the Chevys I’ve had. Color me impressed because I’ve never considered owning a Hyundai, but this car just go bumped up my list of new cars I’d buy. The thing that impressed me the most was that this car is a 4 cylinder, but you’d never know it! For most of the trip the car was loaded with five adults, luggage, with the A/C on. Driving in southern California requires a lot of quick maneuvers and this car took it like a champ! It accelerated like a bat out of hell without any lag or buzzy-ness that you’d normally get with a 4 cylinder. It handled real well during lane changes without much body roll. Cruising at speed was extremely smooth. Sometimes I’d get up to 80 MPH, but it felt like I was going a lot slower. There was virtually no wind or road noise. We were able to maintain a nice conversation without having to shout. What’s interesting is that it looks like a small car from the outside, drives like a small car from the driver’s seat, and inside it kind of feels like a small car from the waist up, but there was gobs of legroom for all passengers. I was able to stretch out my legs without putting the seat all the way back! The trunk was very spacious as well, but the trunk opening was short resulting in a small opening. The interior trim and materials felt top-notch especially with the subtle details like the brushed texture on the dash and door panels. The dash had a very cool multi-colored LCD info center in the gauge cluster adding to the luxurious aura. The projector headlights had a nice sharp cut-off for the bright-as-sun beams. The headlights turned off with the engine so it was hard to remember to turn off the lights in the day time (because it made the radio and cluster dim). I was also surprised to see a foot-pedal parking brake since import cars typically have handbrakes. It felt like a higher class car than it should be. One thing I did not like was the stereo. The display was incredibly hard to read at night since it had a dark blue backlight with black LCD text. I did not test the sound, but getting to the sound settings was not as intuitive as it should have been. The bass/treble settings were buried in a menu where other radios allow access from a button. It did have XM radio, which was pretty convenient. I’m also not a fan of how the Asian carmakers put the headlight switch on the turn signal stick, but now I’m just nitpicking. The positives clearly outweigh the negatives here. It’s an underdog as Hyundai has been winning awards and gaining consumer confidence with their products, but it’s still got the stigma of being crappy from past decades. I can definitely see and feel the Honda-like quality in this Sonata and while I would have never considered looking at it before, I would definitely recommend it to anyone. My sedan has an interesting feature where when the trunk is popped, the lid opens all the way if parked on a level surface. It’s hard to explain it, but it accomplishes this by two tension rods that act as a stretched out spring to rotate the hinge upwards. Most newer sedans don’t have trunks that pop up by itself (or if they do it’s an expensive option as it’s motorized and can also close by itself). On a lot of new cars, the lid only pops up an inch or two and it won’t open fully without someone lifting it. It’s so lame! Closing the lid is also lame. You have to guide the lid down softly (because of the strut not liking sudden motions) and then pushing on the lid to latch. If you do it wrong you’re not sure if it latched all the way or not because it doesn’t show the sign of it popping up. On my car, you give it one swift throw and it slams shut. If you didn’t do it right and it doesn’t latch, the lid just opens back up to show you that you did it wrong. You don’t need to check if it latched of not because it will tell you! Sometimes I admire the simplicity and character of old engineering methods. Is it me or are the trunks of sedans getting shorter and shorter? It’s almost gotten to the point where the trunk is non-existent. I mean, the trunk is still there, but the classic sedan shape is gone. We now have a short height opening with a very short horizontal opening. It makes the trunk very deep, but shallow. With the death of the Crown Victoria and Lincoln Town Car we now do not have any car with a ginormous trunk. What will gangsters drive? You cant fit a body into the trunk opening of a modern car, you’d have to make the body smaller to fit. And you can’t get to anything deep inside the trunk without taking out whatever’s closest to the opening first. It’s very dumb since most people don’t plan what to put in the trunk. They just put stuff in without thinking. It’s very sad that the classic sedan shape is dying. It’s practical and handsome. I shall miss the classic sedan. I find it interesting that different places have different rules regarding traffic light placement. All the lights have the standard red, yellow, green, but the location of the actual light assembly varies. In Texas, all the traffic lights are placed horizontal with red on the left and green on the right. The lights are normally not placed vertically unless it is mounted on the pole. It wasn’t too hard to adapt, but it was obvious. However, in San Francisco and the surrounding bay area, most traffic lights are placed on the vertical pole on the street corner. They are not mounted overhead above the intersection. This makes it very confusing for visitors expecting an overhead traffic light and not paying attention. I’m not sure why there isn’t a national standard regarding traffic lights other than the required colored lights. It would make it easier for travelers not used to the area. Plenty of detailed pics on the internets already. 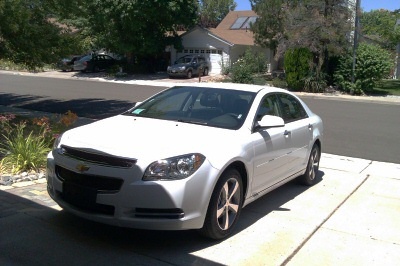 On my trip home I scored a Chevy Malibu for a rental car. At first the rental company gave me a Nissan Rogue (midsized SUV), but I told them I wanted a sedan so they gave me a Malibu that was reserved for premium members (because it was already there). I’m impressed with the quality of the car. The panel gaps rivals the thickness of a CD. The dashboard was as soft as a leather couch (not ice cooler plastic!). There were nice little touches around the car with the Chevy bow-tie in the headlights, reverse lights, and reflectors. The inner part of the wheels were painted dark gray to give them a deeper look. That design aesthetic works well especially since it’s so subtle. It's about time carmakers decided subtle details mattered. While it looked great, driving it was a whole ‘nother thing. 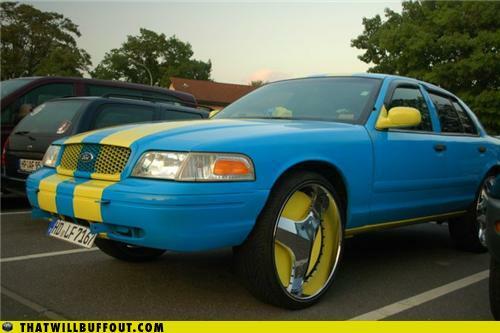 The first thing I noticed was that it had an awful turning radius. I couldn’t believe that it actually had a worse turning radius than a full-size Ford. It’s strange because the car is so narrow. It seems like they took a small car and just added more girth to it to make it a mid-size, but somehow make it handle like a full-size. To make matters worse, it had a terrible blind spot out the back. The rear window was so small and so far up that the trunk and back seat blocks lower rear visibility. Adjusting the mirrors properly helped a little bit, but it was still discomforting. What’s more discomforting is the headrest. I’m not sure what the trend is, but a lot of new cars have headrests that push my head forward and there is no way to adjust the fore/aft position. It handled the roads very smoothly. At first I thought it had a V6, but as soon as I got on the highway it just fell flat on its face. 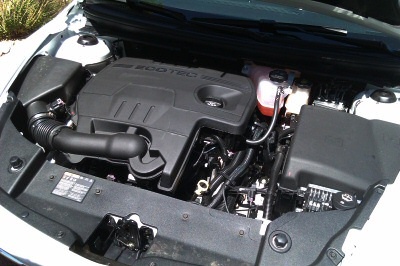 I looked under the hood and saw a large four-cylinder. Coupled to a slushbox, it was a dog. Might as well have a boat anchor in the trunk. It had an automatic with a manual gear selection mode, but I find it to be more of a gimmick than actually functional or fun. I’ve driven smaller cars that felt faster. At least it doesn’t feel like a wallowing boat, but it still had Sneeze Guard in the steering. Not sure why having a dead spot in the steering is still a common “feature”. I suppose if they removed it completely people won’t be able to text and drive smoothly anymore. Moving towards the rear of the car, the trunk is rather tiny. You could not cram anything it there larger than a watermelon. I’m exaggerating, but I swear a Ford Focus has a larger trunk. That’s another thing I don’t understand is why current sedans have tiny openings for the trunk. They need to bring back larger trunks like on the Crown Vic. What are mobsters gonna drive when they need to “take care” of someone? The Malibu is a handsome car, but the driving experience was not to my liking. I wouldn’t buy a Malibu, but GM has come a long way in the quality department. It just needs a few more tweaks worked out to be ready for prime time. What is with the trend of clear taillights? I know I’m a decade late attacking this topic, but it’s still relevant. I was noticing that stock clear taillights rely on red LEDs which can be clear when off and red when on. It wouldn’t be so bad if the LED cluster wasn’t so concentrated. 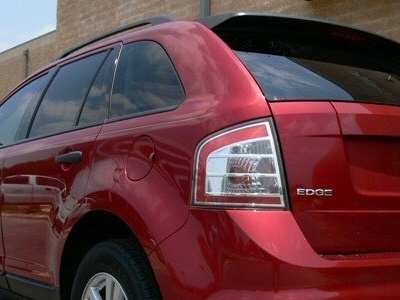 The Ford Edge, for example, has a single cluster of LEDs in the center of a huge housing. In the daytime, it lights up a small ring or red around the LED cluster. It’s not as noticeable compared to an all-red lens. The Prius also uses a similar setup except it uses six large, red LEDs. It’s still too sparse for aesthetic reasons, but it’s more effective than the Edge because of the LED direction (the LEDs still burns the eyes! Damn you Toyota!). The red lens doesn’t just act as a colored filter, it’s also a diffuser to soften the light and make it less harsh which will reduce retina-burning. Another thing is the clear lens itself. Given the track record of headlights yellowing faster than the seasons changing, I can’t see these taillights standing up to the elements. It’ll turn yellow and then the light output would be reduced. I hope they added something to the plastic to make them stay clear longer. I really hope this fad passes because it was stupid when it first came out and it’s still stupid now.